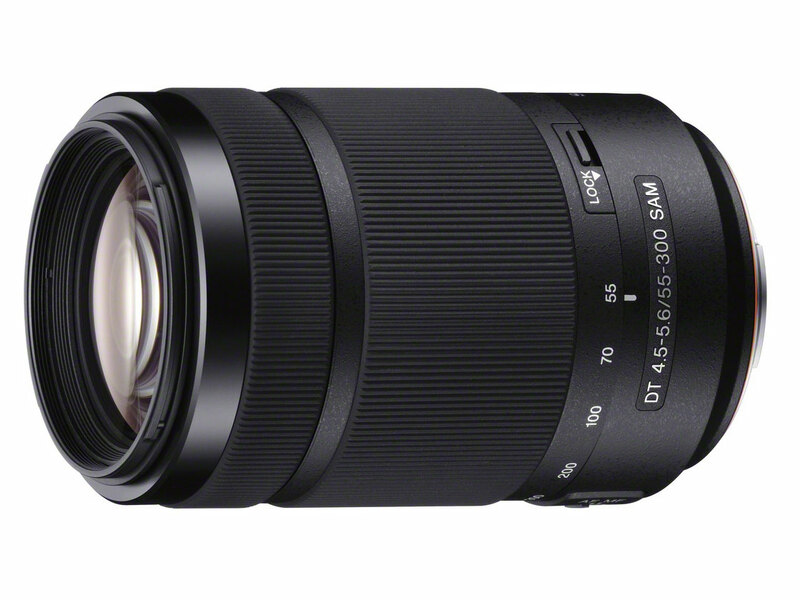 Sony has announced the DT 55-300mm F4.5-5.6 SAM, a budget telephoto zoom designed to complement the 18-55mm 'kit' lens. It's optimized for Sony's APS-C Alpha SLTs and DSLRs, and features the company's Smooth Autofocus Motor (SAM) for fast, quiet focussing. Billed as an ideal lens for capturing stills and video of distant subjects, it features an ED (Extra-Low Dispersion) element, which should reduce aberrations and increase sharpness. It will be available in September for around $300. SAN DIEGO, May 16, 2012 – From flattering portraits to faraway wildlife and fast-action sports, nearly every subject can be captured beautifully with the new SAL55300 telephoto zoom lens, the latest addition to Sony’s A-mount lens lineup. "The new SAL55300 lens is a perfect complement to our acclaimed line of Alpha A-mount cameras with Translucent Mirror Technology, allowing consumers to capture distant, faraway subjects with razor-sharp focused images and Full HD videos," said Mike Kahn, director of the alpha business at Sony Electronics. "With a versatile 55-300mm, 5.5x magnification range, fast, quiet performance and an attractive price tag, it’s a welcome addition to our alpha A-mount system." It looks nice and I really hope it's an improvment over 75-300 they offer currently in this range. The ELD glass should help against the pitfall of that lens, chromatic aberration. This lens is a step in the right direction for Sony, but I am still waiting for the Carl Zeiss lenses to all be upgraded to incorporate the SSM motor just like the SAL24F20Z. This is a beautifully built lens. Smooth as silk and just as quiet. The glass is visibly better than the kit lenses that came with my camera. Comparing photos taken with this lens and my kit 18-55 SAM lens is chalk and cheese. SSM is the lens that u need for video work....anything else will make a lot of noise, which will be picked up into the microphone. we need e mount lenses, 14 and 20 mm pancake, 12-24 zoom, tele-lenses are a smaller part of the market, what makes most of them expensive, the majority of people using cameras make landscapes and tourist photography style, that is the goal of mirrorles. This lens will not help me on anything and those who ow a 18-200 will not step over to this. So, one more item in the list of Sony's useless or contraversed things. this lens is not meant for you ! this is for the alpha range that still use old model back to Minolta days. Sony has larger camera lineup in the alpha range than the NEX. However, NEX owners can still use this one with the adapter, while alpha owners cant ! so leave some space for other guys who love their alpha ! At 300mm, you're able to use the lens wide open at f/5.6...with your SAL18250 at maximum lenght you're at f/6.3, (not as wide as the SAL55300) and 50mm short. But maybe, just maybe, since this lens goes from 55 to 300, will perform better than 18-250, just because is optimized for telephoto usage. You might not. However it does extend to 300mm (not a huge difference), and is f/5.6 instead of f/6.3. I would also expect the optics to be a bit better across the overlapping range. Well because the world does not turn around you. Some people have just a 18-55mm or some people have a 55-200mm but need more zoom. Some people want a cheap knock-about zoom lens to go with their 70-x00mm G.
Who knows ... if it is not for you then don't buy it. I haven't seen tests of the Sony 18-250, but all tests of megazooms in the 18-250 / 270 / 300 mm range from Canon, Nikon, Sigma and Tamron have shown big compromises in terms of image quality, contrast, MTF, distortion, chromatic aberration, vignetting, etc. Generally, if you want to cover the 18-300mm range with good image quality, you'd need at least two lenses: a 18-70mm and a 70-300mm. If you use 3 or 4 primes instead, image quality will be even better. The SAL-18250 doesn't have the SAM motor drive. Why Olympus 75-300 f/4.8-6.3 covering smaller 4/3 sensor costs 3 times more that the Sony 55-300mm f/4.5-5.6? I'm thinking Tamron's OEM business is really hoppin' lately. Looks good. Sony does have some relatively affordable primes. Otherwise, someone buys an SLR with kit lens, where can they go if additional lenses are $400-$500-$600. Try $1300 for Panasonic 12-35/2.8 (vs $650 for Sony DT 16-50/2.8 covering similar range for a bigger sensor). Or $900 for Olympus 75/1.8. Sony lenses are actually a very good deal. Not something I would use but I am happy Sony has launched such a lens and even more surprised at the low price of $300 (compared to the launch price of the Nikon 55-300 and Pentax 55-300). Sony has done well coming up with some good quality inexpensive lenses like the 50mm f1.8, 35mm f1.8, 85mm f2.8 (wish it was f2 though. :( ) and now this lens which will replace the old outdated Sony 75-300mm and possibly compete well with the slightly cheaper Canon 55-250mm IS and the higher priced Nikon 55-300mm. The more exotic lenses like a 50mm f1.2, 600mm f4 prime and a 300mm f4 prime are also important but considering Sony will sell many many copies of the 55-300mm compared to the above mentioned lenses I would wager Sony has given more importance in the right direction. Nikon's 55-300mm is more expensive because it has VR built in. Not denying that but Sony has had a bad habit of charging top dollar for lenses even though they theoretically were cheaper to build than non VR/IS lenses. For instance their 70-300mm G lens is MUCH more expensive than either Canon's 70-300mm IS or the Nikon 70-300mm VR. Similarly Sony's 70-200mm f2.8 G costs about the same as the Canon/Nikon equivalents inspite of the Canon/Nikon versions being optically superior and having IS/VR too boot. So the recent Sony launches - 16-50mm f2.8 (quite a bit cheaper than the Canon and Nikon versions) and now this 55-300mm lens is a step in the right direction as regarding pricing of lenses IMO. Sony 70-300 SSM G should be compared to Canon L.
I do not agree with you. Canon & Nikon aren't having better optics in my opinion. And in my country, 70200F2.8 from both C/N cost extra 500USD than Sony's copy. In my opinion, some C/N lenses & cameras are overpriced. "Sony does not have good lens selection" is code for "Sony doesn't have exotic 600mm telephoto lens or exotic tilt shift lens or 26 thousand versions of a 70-200mm f/2.8 zoom"
Yes, and some of the better lenses are really good - enough to make people want a Sony system just to get those lenses. I understand that may be a good one too, although I was thinking of some Carl Zeiss lenses I've tried, such as the 16-35, 85mm, and 135mm. Actually they took over the camera division from Minolta which was well known for its high quality glass. So unless they didn't also take over the people with knowledge, they have the know-how to create excellent lenses. The whole "I need more lenses" crowd should ask themselves. How many lenses do you actually use? I've got a collection of 7 or so lensens of which I use 3 most often in order of use: Sony 28-75mm F2.8 SSM, Tamron SP AF 90mm F/2.8 Di Macro and recently the Samyang 8mm Fisheye because it's loats of fun!! "Sony does not have good lens selection" is probably a line learned from camera store salesmen who don't have any Sony's in stock. They probably picked that up from some other manufacture competitive sales materials. It's often amazing how long people will keep repeating something like this, even thought it may have always been wrong. I've heard many similar statements before in software sales, and just like politics, it just doesn't matter if it true as long people believe it, for some reason those who don't won't see someone making the claim as lacking honesty because of it. If you only compare "Sony" brand lenses to Nikon or Canon, Sony has a lot less lenses. If you also compare Minolta AF(which most Sony shooters would consider "first party") lenses its not that big of a difference, sure most of the Minolta lenses are very old designs, but you can say the same for a large portion Canon/Nikon's lens selection as well. Tilt/shift, and some rectilinear primes wider than 16mm would probably be the biggest gap in the Sony/Minolta system. The tele end is fine: Minolta 200/2.8, 300/2.8, 300/4, 400/4.5, 500/8 af mirror(no other system has one) 600/4, Sony 300/2.8G, Sony 500/4.0G. Though buying used telephoto lenses like these may not be everyone's thing, all of the Minolta's are discontinued so if thats the case you're better off with Canon/Nikon. Yes, a lot of lenses! Four 50mm's, alot of std zooms with almost the same focal range, five 70-200 mm's, another 5 for 70(75)-300 mm, four 400 mm primes, Not bad, but noone will need all of these. Seems promising unfortunately the lens is designed for crop sensors but great price with a very interesting silent AF motor. Will this shut up the Sony does not have any good lens selection crowd? But while you're writing on this thread at least you're not bashing Samsung on the others. One can only hope they produce many lenses so you can keep commenting on them on the threads and stop insulting other companies and posters on other threads. And capital letters, even better! Does it fill a hole in your life? Oh, of course you want some attention and here you can get it. Professor, you could avoid taking the original comment personally. Why can't you? There is no need to get antsy about a fact. And by dragging your personal issues with another poster isn't exactly making a case for you. I doubt it will shut up the very legitimate gripes about Sony lenses. How many are there for the over-hyped NEX 7 now? Four? Said it before, say it again. Sony is a company that deserves to fail. The poster insists on bringing up a certain company on almost every thread, even if completely unrelated and insults it's products without any factual basis. Then when another poster disagrees this poster starts insulting the poster himself using such vulgar language that they've been flagged as inappropriate. I guess I may have overreacted but I feel strongly when such a great site is taken over by people who contribute nothing to it and bring it's image down. I admit that my post didn't contribute anything to the discussion and apologise to you for the outburst. And the poster didn't do it here. You did. I didn't mention the name of any company. Also you may not be aware that the poster had messages removed because of language so you don't know the whole story. I have also apologised for what I wrote. It is customary to accept an apology with good grace and leave it at that. @ Professor999 you are just the same when you lower yourself to the same level of intimidation and follow a poster around in a vigilante manner, you are the instigator here, have you ever heard of turning the other cheek? You go and get your pack of wolves and put out hateful comments like Sony is a company that deserves to fail. You don't have a lot of creditably now do you? I apologised and can do no more than that. At least when I'm wrong I admit it. I haven't followed anybody around. I've checked the News articles as I normally do and noticed the poster using vulgar language. Please tell me where you've seen my hateful comments about Sony? In fact, I'm the proud owner of a Sony Nex 5n. At this point it is YOU who seems to be trying to instigate something. Why else would you write blatant lies about me and comment on this matter AFTER I have already apologised. I have re-established my credibility by realising my error and correcting it. Just noticed that you joined this site the day after this little situation occurred and after I requested his removal from this site for consistently using disgusting and insulting language in his posts and that the original poster hasn't been heard of since then. Just saw some of your old posts. Thinking about taking back my apology. You're a little hypocritical if you ask me. So what are you insinuating here exactly? You are the bully my friend, how about you crawl back to the rock you crawled out of. Another would be that of 5 posts you have made since joining FIVE days ago TWO have been aimed at me and seem to have been written to provoke. In the FIVE days since joining you have ACCUSED me a making comments against Sony wishing their failure. Which is an outright LIE. That sounds like an attack on me. When I pointed out that in fact I am the owner of a SONY NEX 5n camera you now reply calling me a bully. I am sure the original poster who went very quiet five days ago must feel very happy that a new subscriber who joined only five days ago is such a vociferous defender of his views. Your tone is very similar to the old poster and I'm sure you'll get on like a house on fire when he decides to restart making comments. Please answer my original question and point out my hateful comments. Please let me know this information so as to establish YOUR credibilty instead of calling into question mine. or as you so charmingly put it, 'turn the other cheek'. Rather, you have attacked me. Writing lies saying that I hope Sony fail. For which you still have not supplied any info. Only your words or in this case lies. No, I am not Sam Carriere. But I notice that even though that poster claimed that he wanted Sony to fail in a post 5 days ago you didn't reply to that. Instead you continued to attack me with backing up your accusations. YOU were the one who attacked me in your fist post. Accusing me of wanting Sony to fail. Yes. it shows who I am. Someone who will not back down when attacked and accused of something that he is completely innocent of. I'm sure this will be your last post as you cannot justify anything that you have accused me of. Instead you accuse me of being another poster. Untrue and without any proof to the contrary. As previously mentioned YOU were the one to attack me, I have merely defended myself in the face of your lies. Good specs and good price (surprised actually). Now how fast is the AF motor (and how quiet)? The SAM lenses are generally pretty fast, but they aren't very quiet. 18-135mm and this one supposed to have newer SAM version that is quieter (for video). I have the 35mm SAM prime. SAM isn't much quieter than my screw-drive lenses on a Sony A700. A little bit, but not much. No where near as quiet as SSM. The SAM in the 18-135mm and the new 55-300mm are completly different, they are faster, nearly complete quiet and enables direct manual focus override. should be much quieter than the previous SAM lenses. the 18-135mm was silent! Yep, 18-135's SAM is the same thing as Nikon's ultrasonic motor in cheap lenses, only actually does allow full time manual focus. "and enables direct manual focus override" - any source for the statement that 55-300mm allows DMF? There wasn't anything about it in press release. That 18-135 is much quieter, nice! What speed can we expect if the lens using with LAEA1 & LAEA2 adaptor in NEX 5? (Not NEX 5N). Anyone please reply.. I had a 55-300mm K-mount, and it's surprising how often the wider 55mm end is needed compared to 75mm (for example, when I was shooting my nephew's little league game, and suddenly he walked up close to me, I was still able to barely frame him in the shot). Sadly, no. The old 75-300 is Full-Frame, and this is just for APS-C. Maybe the only alternative is the SAL70300G. But yes, I'm waiting too for an E-mount alternative with OSS. Although the 75-300 was fullframe compatible, but it was the Kit-lens for the digital APS-C cameras of Minolta (D5D and D7D). It is weak at the long and and extremly weak at the borders if used on a fullframe Body. Nobody using a A900 or A850 would consider to use the 75-300. The 55-300mm is the replacement and a very good one. I believe Sony's plan to launch new lenses in 2012 includes a high magnification zoom lens for E-mount as well, and that likely implies a variation of this lens.